I think this is a remarkable book for a number of reasons. It is medically accurate and believable (Gawande is a surgeon at Brigham and Women’s Hospital in Boston as well as a professor at Harvard Medical School and the Harvard School of Public Health). It is well written (he is a staff writer for The New Yorker), the arguments about what should and should not be our goals in caring for the aged and terminally ill are thoughtful and well constructed, and, most of all, he describes the human foibles that we see every day in the real world, which can undo even the best-intentioned and careful end-of-life care planning. 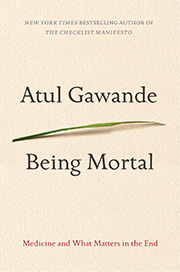 Gawande’s thesis is that high-tech modern medicine often fails older people or those with terminal illness – people it is supposed to help. 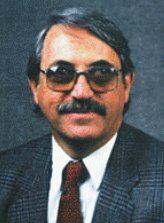 ‘The waning days of our lives are given over to treatments that addle our brains and sap our bodies for a sliver’s chance of benefit.’ Using some poignant biographical sketches of family members and a retired geriatrician, he describes the medical and societal changes of the past 50 years or so that have changed our attitude to and experience of aging and dying. He tells the story of the poorhouse, the aged care facility, the nursing home – ‘designed to be safe but empty of anything they care about’ – a trend perhaps interrupted by the advent of assisted living. The last three chapters deal with terminal illness and include the tales of several memorable patients including Gawande’s own father with his cervical cord astrocytoma. Gawande paints a true picture of how the patients, their families, and their doctors stumble through the minefield of decisions and choices – sometimes getting it right, sometimes getting it wrong. Palliative care and home-based hospice are well described and their value demonstrated, although the point is made that hospice is often involved only in the last few days. And ‘Which funeral service do you want to use?’ is not a question I ask at the first visit. There is thoughtful discussion about how we should be communicating with these patients and their families, without being paternalistic or expecting patients to make decisions they are not qualified to make, but with guidance – the so-called shared decision-making. But done right, it’s never easy. For anyone who works in palliative care, this book provides a thoughtful discussion about the problems we encounter regularly that rings clinically true. And it’s enjoyable to read. Few would argue with the importance of helping patients sustain a sense of meaning, particularly in the last months of life as they confront death. The ability to sustain or enhance a sense of meaning in advanced cancer patients helps them maintain a sense of hope and purpose, improves quality of life, lessens symptom distress, and diminishes distress and despair. Well, that’s what these little treatment manuals are all about. A carefully developed and structured eight-week psychotherapeutic intervention, for individuals or groups, shown to be of benefit in randomized clinical trials. 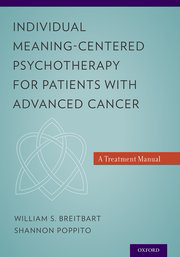 Reference is made to a forthcoming OUP publication by the same authors, titled Meaning-Centered Psychotherapy for Cancer, which I presume will be a wider discourse on the history of the psychological and philosophical development of our understanding of meaning to the human being. But the basics of what you need to know are contained in these manuals. After an introduction regarding the rationale and goals of the treatment, there is a chapter describing each session, including homework and experiential exercises: 1. Concepts and Sources of Meaning; 2. Cancer and Meaning: Identity before and after Cancer Diagnosis; 3. Historical Sources of Meaning: ‘Life as a Legacy’ That Has Been Given; 4. Historical Sources of Meaning: ‘Life as a Legacy’ That One Lives and Will Give; 5. Attitudinal Sources of Meaning: Encountering Life’s Limitations; 6. Creative Sources of Meaning: Creativity, Courage and Responsibility; 7. Experiential Sources of Meaning: Connecting with Life through Love, Beauty and Humor; and 8. Transitions: Final Reflections and Hopes for the Future. For reasons that are not immediately apparent, the third and fourth sessions are compressed into one in the manual for individual therapy. I was impressed by the potential value of these interventions. In the palliative care setting they could be facilitated by experienced nurses, social workers, counselors, and pastoral care workers as well as physicians. 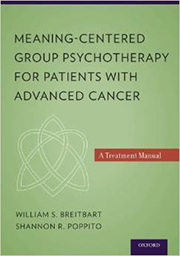 I await with interest Meaning-Centered Psychotherapy for Cancer, which I hope will provide more substantive background to these therapeutic approaches. Review copy supplied by Footprint Books Footprint. This is a textbook for students of gerontology, the allied health professions and perhaps nursing. So what’s the difference between ‘normal aging’ and actual pathology? 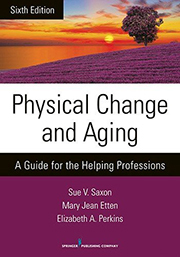 This book describes these physiological changes associated with age and the pathologies seen in older people, system by system. And I have to admit that where medical matters are dealt with, this book provides better and more accurate descriptions than some I have seen. The chapter on complementary medicine suffers from the usual problems, consequent upon the lack of a solid evidence base; for example, therapeutic touch (which normally involves no touching) is said to be one of the fastest growing and most popular therapies, but I have to admit that I remain unconvinced. The publisher indicates that instructor materials, including PowerPoint presentations and banks of questions for each chapter, are available but I have not reviewed them. I think this is a good guide for the intended audiences and if your work in palliative care involves a lot of older patients, then having this book available could provide a lot of perspective.